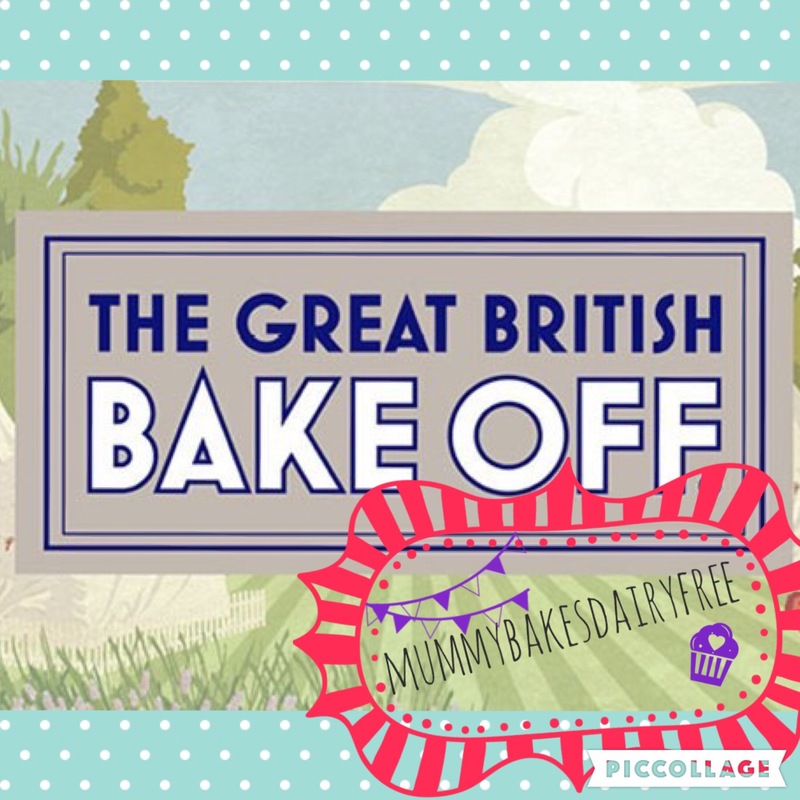 So that’s it for the Great British Bake Off 2016 and for mummybakesdairyfree does the Great British Bake Off. I’ve really enjoyed baking along each week as it’s definitely made me vary what I bake. It’s given me the opportunity to try some recipes that I’ve wanted to for a while, aquafaba meringues, for example and reimagine old favourites. As you will know, not all of the bakes have been successful over the past ten weeks, and I’m planning to go back and retry those again soon, maybe! My intention when I started this challenge was to create a bake from the tent each week and make it allergy friendly. I also wanted to stay true to my objective of the blog: To create recipes which are not only allergy friendly, but also simple, healthy, cheap and for the whole family. On the whole I felt I hit most of these aims each week. I did use far more refined sugar than I’d like but life is about balance and we don’t eat cakes and desserts every week! Let’s talk about the successes! My most favourite recipe from the ten weeks has definitely been my Strawberry Bakewell Tart. Trying to make a Bakewell Tart which is not only egg and dairy free, but also nut free seemed like an unlikely possibility. However I found that using ground rice in place of the ground almonds gave the tart a similar texture. A great example of how experimenting with different ingredients can solve Free From problems. This bake also gave me a reason to try making Strawberry Chia Jam which was beyond easy and completely yummy. It’s also featured in my last bake, Vegan Victoria Sponge. Bread week also meant I made my first loaf of bread, a Vegan Chocolate Twisty Loaf. Since then I’ve made a savoury pizza version which was delicious and works well for those who aren’t fans of sandwiches. Yes making the loaf takes time but it is a fairly simple process and well worth the effort. On the other hand, there were a few less than successful bakes. Meringues in particular. I’ve only made meringues the traditional way with egg whites a few times and had always been pleased with the results. I had heard good things about making vegan meringues using aquafaba (the liquid from a tin of chickpeas). I looked at lots of different recipes and techniques, which I think was my first mistake. It’s always a good idea to find and follow one recipe instead of mixing together a few. I did use aquafaba again to make the Mini Chocolate Mousse Cakes and this time it worked brilliantly! The Palmiers were also not a resounding hit. They did taste nice however they weren’t light and flaky like puff pastry should be. It was a case of too many substitutions. Next time I would freeze the dairy free spread and grate it into the flour. I’d also stick to using white flour before trying wholemeal. However the sun dried tomato and olive filling was spot on and I would use that in other recipes. This challenge has seen me take inspiration from lots of different sources and I’ve enjoyed pulling the knowledge I’ve gathered over the past year of allergy cooking together. Whether I do this again next year when the Great British Bake Off moves to Channel 4, I haven’t decided but I’m certainly going to be more adventurous in what I bake. 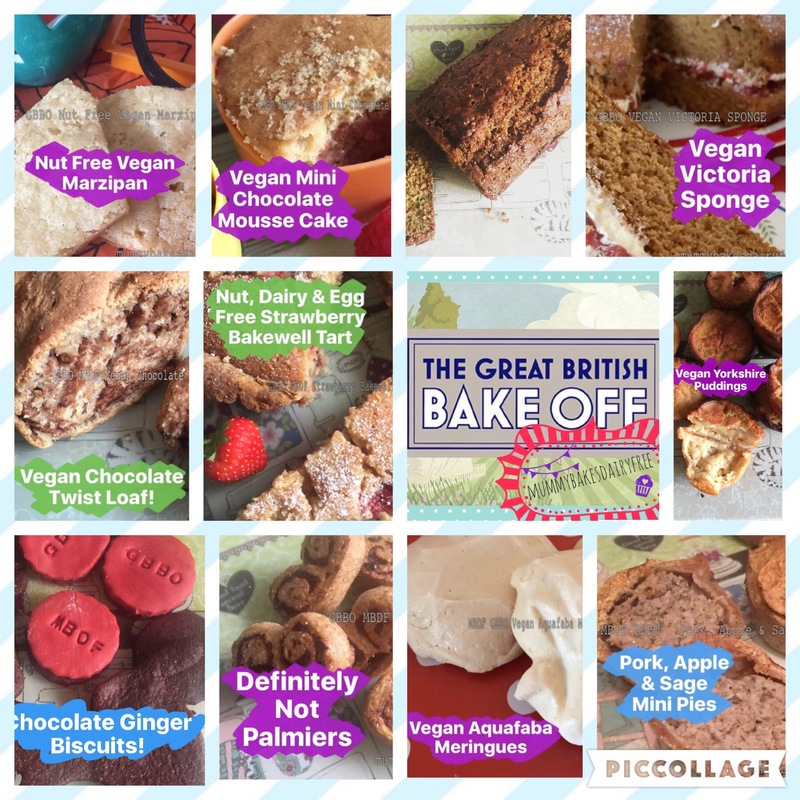 If you’ve made any allergy friendly bakes inspired by the Great British Bake Off then I’d love to see them!! Ooh shall definitely try the stock baking block!! As I was making the pastry I knew it was too soft but was interested to see the outcome, not great haha!! I was surprised at how similar the texture to the almonds in a Bakewell tart the ground rice was and it didn’t miss the egg at all!